Before I left for my vacations I thought today was going to be "the best photo of the year theme day", just like last year. But... I discovered only after my departure that it had been postponed to January 15th and that, instead, today's theme day would be "changes" (click here to view thumbnails for all participants). So let me show you a change... in attitude. 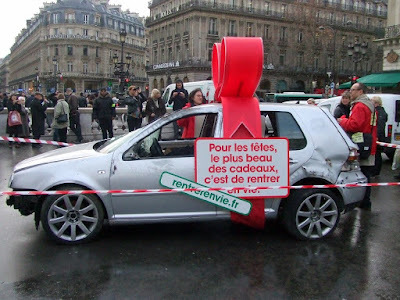 The French are now more conscious than before of the damage caused by drinking and driving. And in case they would forget, the government has a few messages for them. Hence this campaign that goes "For the holidays, the best gift is to come home alive" which I think is pretty effective. I know it's not a very festive photo for the first day of the year, but it's at least an optimistic message! Happy new year everyone, don't forget that this year PDP will turn 5. Merci Flore, happy new year to you too! It's still 6 pm where I am, so not yet the time to say "bonne année" ! Love the picture. Many thanks to you. Bon réveillon et Champagne !!! Eric, are you planning something special for PDP 5th birthday? Bonne année to all! It's past midnight in Europe, but not yet time to say Happy New Year in the States (though I've been saying it for days already). I'd like to know the answer to Thib's question, too. A special birthday party for PDP on March 11th, perhaps? Pasadena Daily Photo (PDP Jr.) celebrates its second birthday tomorrow (January 1st). I'll be linking to PDP. Eric, I can't thank you enough for the inspiration. May I join in that request/suggestion, Eric. Something special to celebrate the 5th birthday of this bringing together of a community. What do you think? I will check the boards to see if the idea is getting a run. Health and happiness to you and yours, Eric. Good choice for today. It's a really good campaign - a clever one. Wishing you a very happy and peaceful and healthy New Year, Eric. Bonne annee, Eric: Just a quick note to wish you the very best for 2010 - have a great year! And I look forward to PDP's fifth anniversary celebrations! Bonne annee, Eric, and to all! Thank you for your great blog and how it bring so many people together. Hope your have a wonderful 2010! Happy New Year, Eric! A great change in France ... I hope people listen and take the message to heart! Hi Eric, happy new year 2010! Very effective photo! It screams "Ouch!" Drinking and driving, yes, a very bad combination. My brother was hit by a drunk driver when he was 5 years old. He almost died. It literally broke everything in his body from head to toe. The impact was so great that his clothes and shoes flew off his body. The story has a happy ending. He is alive today and a great artist and father of six children. He's a real sweetheart. I am so happy we did not lose him. My New Years is quiet. I am watching the French film classic "Jules and Jim". I have seen this film about three times. There is just so much to see. I looked outside my window to see how busy the street is. There are a couple of nightclubs down the rue that a lot of young people go to, so there are a lot of young people on the street hanging out because of that. I did not drink champagne. I have some champagne from Alsace -- of all places. It is a Rose champagne or what they call a "pink champagne". But I just wasn't in the mood. And alcohol makes me sleepy. I do not have the resistance to it as I did when I was young. I could drink a whole bottle of Champagne like a soda. And bonne année to all the PDPers. I wish you all a fantastic year!!!! Eric of course we won't forget that this year PDP turns 5. It's amazing! Even more amazing is how all of us here manage to spend the whole year together. And don't we have fun?!! I hope this year one of the highlights will be meeting some of you, just like I did last year and it was certainly one of the happiest moments of my 2009. Eric was this picture taken near the Palais Garnier? A sobering message! Happy New Year and cheers to the CDP 5th anniversary this year! A good campaign of course! But Eric, I must tell you that the car looks so much like many we see all over Paris, that I had to read the sign to understand! Bonne Année Eric and hope to see you soon. And let's get the PDP party started as soon as I get there! Happy 5th blogiverary in 2010! Nice choice for the theme day!! An attitude change - yes! A positive message and here is hoping you and everyone will have a wonderful year. an interesting post with a message. Happy New year! Great message. Happy New Year. Thanks a million for all your messages everyone. It feels good! I'm currently in Boston - where everything is beautifully covered with snow. I had a super new year's eve with a few French friends who live there and American Friends from Vermont that I had not seen in a long time. It really made my evening! Some people say that what you do the first day of the year will be what you'll be doing all year long, well if this means reconnecting with friends, well I'm looking forward to 2010! We'll celebrate early I hope! Excellente illustration du thème "changement", bravo pour ce choix Eric. Pardon de ne pas commenter tous les jours, plus le temps, mais j'ai adoré tes sapins verts en bouteilles recyclées, ton traîneau du père noel tiré par les rennes dans le ciel parisien, et surtout ta scène de neige sur le pont Notre Dame. Bonne année à toi et à ceux que tu aimes. Kisses to share around you. Whether the change in attitude is from the top down or the bottom up, this is one change that I'm glad to see the French getting behind. Meaningful representation of the theme. Bonne année ! et continue à nous régaler les yeux !